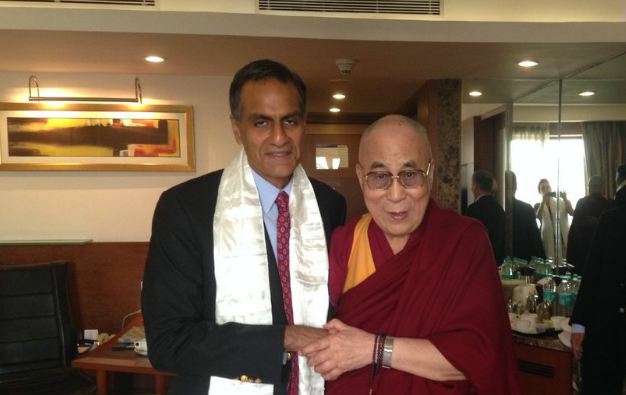 (TibetanReview.net, Sep07, 2016) – The US Ambassador Mr Richard Verma has on Sep 4 called on Tibet’s exiled spiritual leader, the Dalai Lama, while reportedly on a personal trip to McLeod Ganj, Dharamshala, for two days, along with his wife and children, reported the IANS news service. The report cited sources as saying only close aides of the spiritual leader were present at the meeting which lasted nearly an hour. The report cited an unnamed senior official in the Dalai Lama’s office as saying the visit was routine and meant to promote understanding between the US government and the Tibetan leaders. In this connection the ambassador was also reported to have met with officials of the Central Tibetan Administration, including its executive head Lobsang Sangay, on Sep 3.